I'm in the Pacific North West, definitely kapha-country here. I'm a vata, though, so I enjoy the wet, just not the cold that often comes with it. i agree with u . i am a kapha and as anyone practicing ayurveda knows wet and cold weather is not great for them. i live in ireland now . i rains cats and dogs all year around and the sun playing hide and seek during spring and early summer. for the past couple the sun is out and shining bright. it has great effect on my health. when i moved to ireland from india 7 yrs ago, i never thought the weather will affect me so much. my asthma and weight gain all started here. i get slow and stagnant with the cold weather. and couple of years ago i started noticing what is bringing these problem . i get so active and overjoyed when i see some sunlight . i do prepare for the seasons coming and try my best to wake up before kapha time. 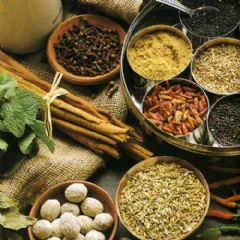 in spring kapha exacerberates and i should look out for any changes and follow the ayurvedic prescription. also i add loads OMG loads of spices over the week , and definitely some yoga and medititation. I am in South Louisiana and the hot wet summer season is already here. One thing that interests me is the difference between Indian seasons that are mentioned in almost all the ayurveda books and the way that translates to American seasons. We spend most of the year here in Pitta season, while I imagine that is much different in the rest of the country. What season are the rest of you in and how do you adapt to them? Do you make a formal acknowledgement and effort or does it just creep up on you? I moved back here from a dry climate and have been having a rough time readjusting to Louisiana's humidity. Before I moved, I told myself that I was born and raised here, so I should be able to handle it, right? That 30 years in California and Texas though made a huge difference. It seems I have had a pitta imbalance since I came back and since I have a lot of pitta in my prakriti already, I have been trying to balance that ever since.